Newly appointed director general of the Department of State Security, Lawal Musa Daura, has demoted Marilyn Ogar, the agency’s former spokesperson, via a memo. Apart from demoting Ms. Ogar, the acting DSS director general also directed the demotion of numerous other officers of the agency who were just promoted in March in what was seen as a politically motivated exercise. 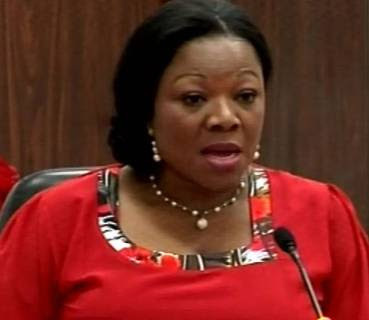 Ms. Ogar was seen as a controversial official of the DSS who often made statements that were deemed partisan. Her promotion was viewed as a reward for doing dirty political jobs for former President Goodluck Jonathan and members of the Peoples Democratic Party (PDP). SaharaReporters learned that Ms. Ogar is currently on vacation, and is reportedly visiting her children resident in the US. In addition to her premature promotion, Ms. Ogar was was also offered a generous scholarship to do a PhD in the UK, according to one source at the agency. Mr. Daura also fired Abdulrahman Mani, the chief security officer to President Muhammadu Buhari and immediately replaced him with Bashir Abubakar, an assistant director in the Bayelsa State command of the DSS.